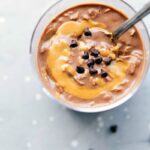 Chocolate and peanut butter flavored overnight oats. 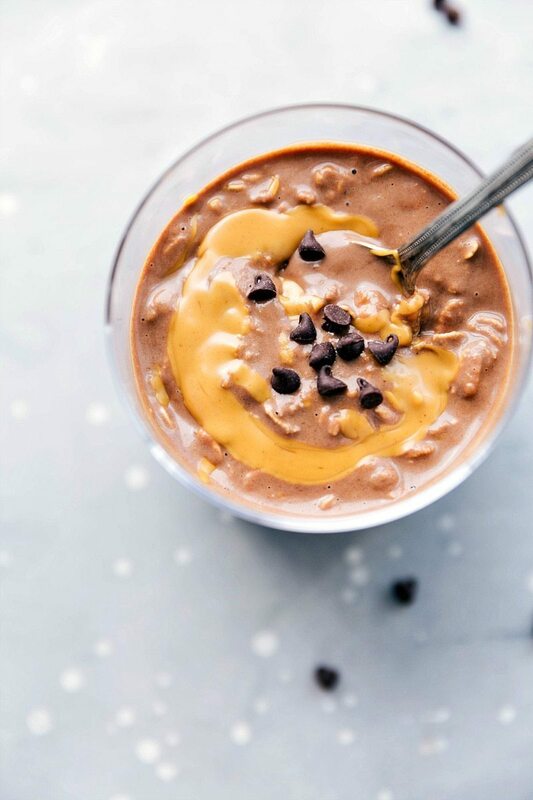 These peanut butter cup overnight oats are a fun twist on classic overnight oats. 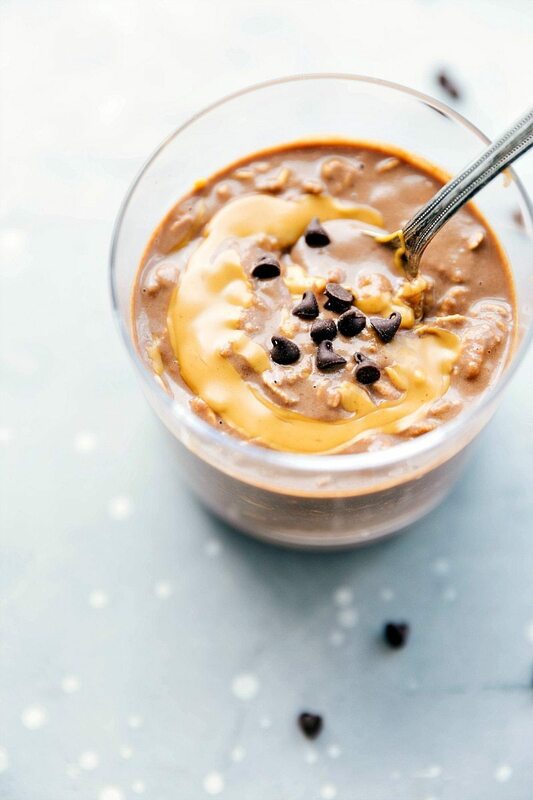 I know we’ve discussed my obsession with dessert-like breakfasts so you probably aren’t at all surprised that I would turn overnight oats into a dessert-like treat. 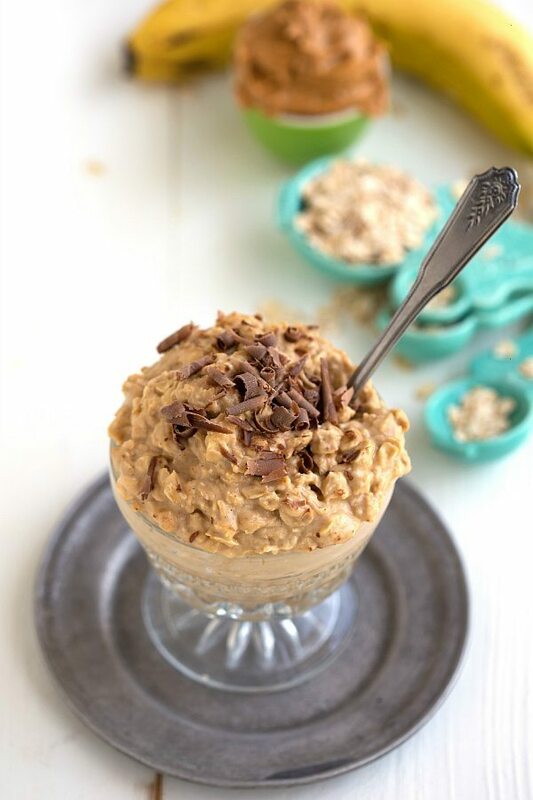 Namely peanut butter cups into a peanut butter cup overnight oatmeal! The good news is, these oats are healthy…like they don’t ACTUALLY have peanut butter cups in them. But they do taste like it with lots of chocolate and peanut butter! I can’t decide if I like these oats better or these brownie batter overnight oats, but I do know one thing – overnight oats are the best. Like the easiest, on-the-go, healthy breakfast there is. And I love the variety overnight oats can have. The morning of eating these, I love to add in some dark chocolate chips. I love the extra chocolate, but feel free to omit the chocolate chips or substitute with a different kind of added chocolate like carob chips or even milk chocolate (not as healthy, but YUM). Make sure to really stir in the peanut butter. These oats won’t taste as good if the peanut butter isn’t thoroughly mixed and mashed in well. I recommend regular vanilla yogurt as opposed to Greek yogurt. While I love Greek yogurt, it tends to be a little over powering and tangy in these oats. Regular vanilla yogurt gives a nice creaminess and a very subtle flavor! If you don’t want to wait overnight I often make these right when I wake up and stick them in the fridge. After I get ready I’ll grab them on the go or enjoy them then. The texture is a little different, but honestly I like it best! 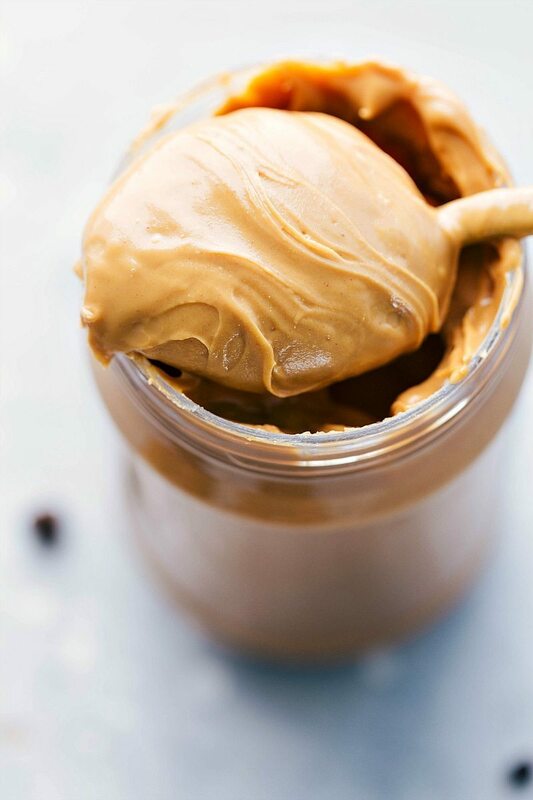 In a small bowl, combine the peanut butter, vanilla extract, and salt. Microwave for 10 seconds, stir for 10 seconds, and microwave for 10 more seconds. Add in the yogurt, milk, oats, cocoa powder or dry pudding mix, and sweetener. If desired, add in dark chocolate chips. If you don't want to wait overnight I often make these right when I wake up and stick them in the fridge. After I get ready I'll grab them on the go or enjoy them then. The texture is a little different with only being chilled 20-30 minutes, but I actually like it best! I keep meaning to try overnight oats but just never seem to do it! They always look delicious and I love anything with oats … this flavor sounds awesome! Anything with peanut butter and chocolate I can get down with : ) Happy friday! I love overnight oats and this one sounds delicious! Peanut butter and chocolate? That means I can totally justify having chocolate for breakfast – sounds perfect to me 🙂 Happy Vday Chelsea and hope you have a wonderful weekend! My kind of fun breakfast. Bet we’d all enjoy this one. Looks filling and delicious. This has my husband’s name written all over it! Inspiring – and stunning photographs! – as always! I’m so making these right now so I can have them for breakfast tomorrow!! I LOVE dessert-like breakfast, and I’m sure that this one will be a total winner at home. Oh wow, it looks delicious! I love that you ALWAYS have healthy sweet recipes for breakfast – looks like another winner! 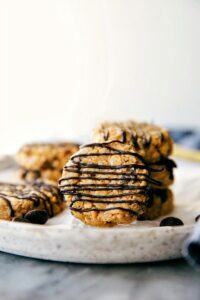 I love trying to step outside my recipe comfort zone and although I’m not a super fan of oats may have to try this recipe sometime! All I can say is: Yum!! I have never thought of making oatmeal like a dessert, how awesome. This is a keeper! This looks amazing! I love overnight oats so much! Thank you so much Jilly! And thanks for sending out some of my links – that’s so great of you! 🙂 I hope you two enjoy the pizookie, have a good one! I tried this this morning and it was out of this world! I think it might be good with toasted walnuts, too, but it would have a higher calorie count, of course. Thanks for posting it!! This was delicious! I added a baby banana to mine and used 2T reduced fat peanut butter. Thanks for the recipe! Those are great additions/substitutions! I’ll have to try that next time 🙂 Thanks so much for taking the time to comment! These are sooo good. Making this for the third time and I’m already excited to eat it! Once I subbed in chocolate soy milk and that was delicious. Love this recipe! That’s so great to hear!! Thanks for taking the time to comment Mary! And chocolate soy milk sounds amazing! Do you think this would work well with Steel Cut Oats? No, sorry! Quick oats are okay but this is best with old fashioned oats. Oh I am SO glad you commented! I didn’t think they would work very well with steel cut oats, but I am glad to hear they do! Thanks Michelle! Ive made this no less than five times and I LOVE it. Thank you for such a great tasting but healthy recipe for breakfast. Just made these and they are in the fridge! My 5 y/o can’t wait to try them tomorrow. Can you sub in anything for the low fat vanilla yogurt? Can we omit the yogurt and do extra milk, or will that make it too soggy? Trying not to run to the store. Lol! Sorry Jackie I haven’t ever tried that out! I do know the yogurt gives it a very nice and thicker consistency though so I probably wouldn’t leave it out! Can you make these with steel cut oats? I would not recommend steel cut oats. This looks SO yummy!! I’m on the Trim Healthy Mama eating plan and was wondering if Greek yogurt might work? I’m thinking it may be too tart, but has anyone tried it? Maybe I can sweeten the greek yogurt before adding it in with extra trivia or something. I think I’m going to try it anyway! 🙂 Thanks for the recipe! Found this on Pinterest last week and made it over the weekend. My daughter and I love it! Thank you! I’ve been eating this every morning for the last few weeks, so good! Thanks for the recipe! Ridiculously good! I used fat free probiotic vanilla yogurt and only 1 tablespoon of peanut butter, and the full amount of cocoa powder. This feels like a cheat meal- very satisfying!!! Thanks for the great recipe! I just discovered your recipe for overnight PB cup oats. I recommend warming the peanut butter and milk together before adding the other ingredients. That way you can get it thinned before adding the yogurt. It mixes together better. Otherwise, very good recipe. I’ve never had overnight oats before but I’ve made it twice since I found your recipe! So glad to hear you’ve enjoyed these!! 🙂 Thanks for the comment! I am eating this right now. I hate oatmeal but this is one of the best things I have ever made!! It is soooo good. 🙂 Thanks for the idea! You claim this recipe to be “healthy” but adding the calories in my head and macros it’s really not. 500 calories, 17g of fat, and 50 g of carbs. Granted this is a rough estimate but pretty close. Yes, it looks pretty dang delicious though! I absolutely think it’s healthy!! I believe health is so much more than counting calories or fat grams (especially with all the healthy fats in this recipe! ), it’s about fueling your body with nutritious and good foods. Peanut butter, oats, yogurt, almond-milk — all good wholesome foods that are healthy and very filling for your body. I have to omit yogurt due to an allergy. Maybe adding a banana will add more texture? Thank you for the recipe, I’ll be trying it tomorrow. There is a way to keep it under 350 calories, without the yogurt (just food for thought). I’m a calorie “watcher”, so I don’t mind a few extra calories! Looks so yummy! I’m going to make it now for the morning. Thanks for sharing! I just made this for tomorrow morning, used natural PB, plain Greek yogurt, almond milk and a tiny bit of maple syrup. I also added a tbsp of chia seeds to boost fibre and protein. I don’t usually comment, but these are absolutely fabulous! So delicious they are my new obsession!!! This tastes just like Reese’s! I added a tablespoon or two of chia seeds and it was absolutely delicious. In my mind that’s the best thing a breakfast could taste like 🙂 Thanks for the comment! This is my new favorite breakfast. It tastes like cake batter!! Yayyyyy!! I’m so glad you enjoyed! Thanks! This recipe is amazing. My daughter and I are obsessed. So good topped with a sliced banana. This is super good. I used hot chocolate mix instead of the pudding because that is what I had and it was so good. I do not like cooked oatmeal but this is different. Glad I found your blog. I’m soo glad you enjoyed this! And yummm a hot chocolate mix sounds amazing! Thanks Sandra!